What do these three recent scandals have in common? The investigation into PEI’s Provincial Nominee Program, in which contracts were awarded to government friends and millions of dollars are now unaccounted for. The whistleblowers who would not go along lost their jobs. The allegations that the Prime Minister’s Office pressured former Attorney General and Justice Minister Jody Wilson Raybould to support a remediation agreement rather than criminal prosecution for Montreal-based corporation SNC Lavalin. All three situations occurred under a single party majority government. In BC, the Clerk was appointed by the governing BC Liberals – and his deep ties to that party were an open secret. It is also alleged that BC Liberal Party strategists were meeting with him to try to prevent the scandal from being exposed. If the Liberal majority government hadn’t been replaced by a minority, would these allegations ever have come to light? Federally, if Wilson Raybould was pressured to give SNC Lavalin a sweetheart deal, who was in the rooms when that happened – except Liberal Ministers and strategists? With first-past-the-post, 39% of the popular vote got the federal Liberals 54% of the seats – meaning no-one else needed to be in the room when those conversations happened. Now that the allegations against the Prime Minister’s Office are in the open, how can they be investigated? With 54% of the seats, the Liberals have a majority on every committee, including the Justice Committee. Predictably, Trudeau has refused to let the Justice Committee investigate. How effective would an investigation of the Prime Minister’s office conducted by a committee with a majority of Liberal MPs be anyway? Very simply, proportional representation means multi-party (or better) oversight on decisions and more eyes on the books. With two or more parties governing together, it’s harder to make secret decisions that benefit only one party and its friends and donors. 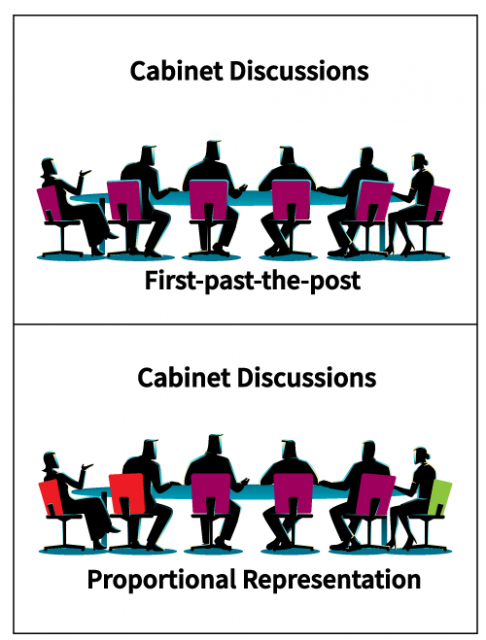 A Cabinet in a country using proportional representation with a coalition government is composed of Ministers from more than one party. In Germany and the Netherlands, the Minister of Justice is even from a different party than the Prime Minister. Makes for a very different conversation. When the Liberal government received the results of their online survey in 2016 – Mydemocracy.ca – they didn’t publicize most of the results. 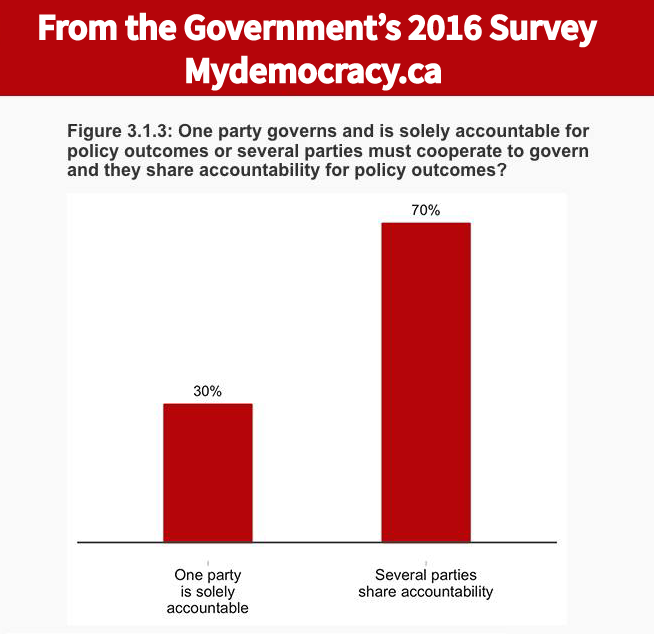 Asked four different ways, respondents overwhelming supported shared decision making and shared accountability – the kind of governance Canadians would get with proportional representation. (SEE PICTURE BELOW). Cooperation and power-sharing may not be easy for parties, but when it comes to accountability, more eyes on what’s going on protects citizens better than any empty promise later to “clean house” ever will.